The Happy Easter Tower presents your friends with box after box of yummy Easter treats in a spring gift box set that they can use over again. From yummy lemon cookies to scrumptious chocolate fudge cake, your good taste will shine when this Happy Easter Tower arrives to wish your loved ones well. 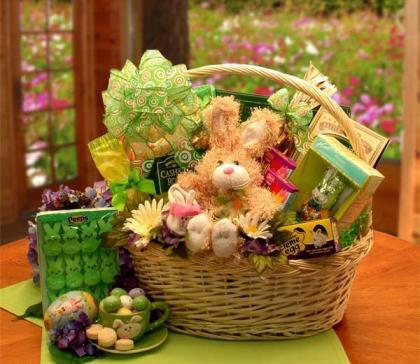 This gift includes the following: Spring Gift Box Set, Mrs. Grace Lemon Cookies, Mrs. Beasley's Chocolate Chip Cookies, Chocolate Fudge Cake, Foil Wrapped Chocolate Eggs, 6 Asst Ghirardelli Chocolate Squares and White Chocolate Peanut Butter Filled Chocolates.